A fireplace should be the natural focal point of any room. The fireplace mantel is particularly important, because it helps to set the tone for the room. If you are seeking a modern look to your room, SoCal Fireplace Mantels can help. 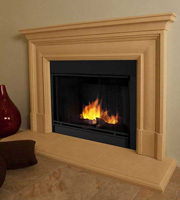 SoCal Fireplace mantels is your leading provider of modern fireplace mantels in Los Angeles. Whether your room features a clean, sleek look or focuses on comfortable yet stylish modern features, SoCal Fireplace Mantels has a design that is ideal for your needs. Our design experts will work with you to select a design that compliments your room, or help you choose a design from which you can build the rest of your design around. They can even help you create a custom design that is uniquely suited for your needs. SoCal Fireplace Mantels is a premiere Los Angeles modern fireplace mantels provider because of our wide variety of materials and designs. Choose from natural stone such as white marble, colored marble, travertine, limestone, sandstone, and more. Natural stone provides a timeless look that highlights the clean lines of a modern design without sacrificing warmth. Cast mantels offer a solid, even appearance and as such they are well suited for strong lines and designs, making the design feature the star of the mantel’s design. In addition to being a leading provider of modern fireplace mantels in Los Angeles, SoCal Fireplace Mantels is also a leader in the design and creation of overmantels, statues, fountains, benches, and architectural precast features such as columns and facades. Choose a premade product or work with one of our design experts on a custom design. Our staff can even come to your home and view the fireplace, garden, or building façade to help create a mantel or product that is made just for your needs. Call today to request a catalog or visit our extensive 4000 square foot showroom in Van Nuys. View our large selection of mantels, overmantels, and other products and find out firsthand why SoCal Fireplace Mantels is the premiere Los Angeles modern fireplace mantels provider. Our expert staff is ready and waiting to answer all of your questions about modern fireplace mantels and other products in Los Angeles, Orange County and Ventura County.